Could you and should you write a novel in a month? Today marks the first day of NaNoWriMo, otherwise known as National Novel Writing Month, when thousands of writers worldwide join together with the common aim of writing a novel in a month. But if you’re new to the idea of NaNoWrimo and wondering whether the idea is totally crazy or actually has some purpose, I’d like to explore the pros and cons of freewriting and what you can gain from this approach. First of all what is NaNoWrimo? But does this apparently crazy approach to novel-writing actually work? What is the purpose of writing so feverishly as this? NaNoWriMo is effectively a month-long freewriting programme, where participants are encouraged to freewrite an entire novel. Most participants spend no longer than around an hour per day writing, so this really is a case of writing the first thing that comes into one’s head. You don’t go backwards and edit, you don’t worry about whether your character hangs together or whether the plot makes any sense whatsoever. Some NaNoWriMoers do in fact ‘plan’ in the month before, so they have a rough outline before they start, but most just plunge in with a germ of something that fascinates them. The idea is that you get something down and you learn to overcome writer’s block once and for all. At the end of it, if you complete the marathon, you will have 50,000 words of very rough writing which you can then re-read and unravel and edit into something fresh. This year, I will be fascinated to watch the progress made by some of my clients as several members of The Completion Club here at The Writing Coach have opted to join in with NaNoWriMo and I’ll be excited to see what they produce. Surely no-one who writes a novel this way ever gets published? Julia Crouch, for example, a former client of mine, came to work with me with a rough NaNoWriMo novel under her belt and she talks here about how she went on to polish it into a finished novel and get a three book deal with Headline UK on the back of it. 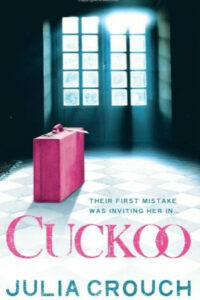 I’m immensely proud to have been part of the process that led to the publication of Cuckoo. It’s important to remember that what NaNoWriMo provides is a framework that can enable you to get beyond any blocks and get words on a page. But it’s what you do with those words afterwards that really matters. Freewriting enables you to get past your own self-consciousness: your fears of ‘getting it wrong’ and not being sure if you have a story within you. Once you have that very rough draft, then you can spend as much time as you want shaping it, editing it, taking out the bits that totally don’t work, adding new characters and depth, a better plot and improving the language. Would you work that way yourself? In truth, I think that every writer has to find his or her own best way to write a novel (or a book of any kind) and I don’t think that any of us have a right to prescribe that method to others. 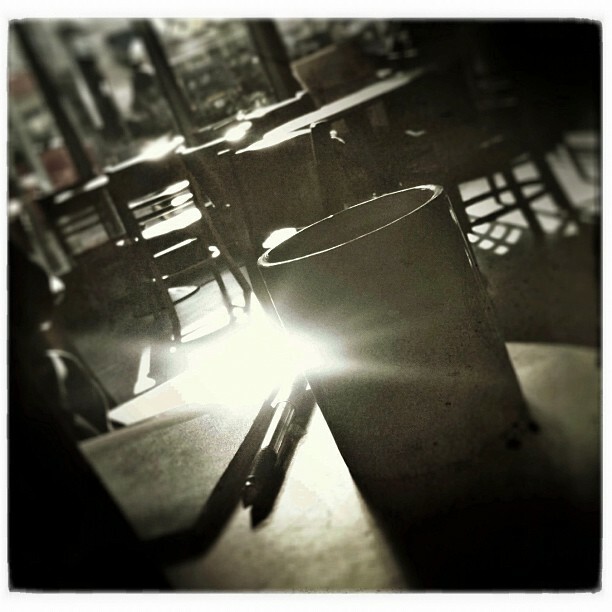 NaNoWriMo is one way of working that has been successful for many authors. Around 200,000 people sign up for NaNoWriMo each year (and around 30,000 complete the marathon). So if you look at the list of published authors in that light, it doesn’t look so good. That’s not the point. The point is – if an author is going to be good enough to finish writing a wonderful, polished novel, they will probably do it with or without NaNoWriMo. 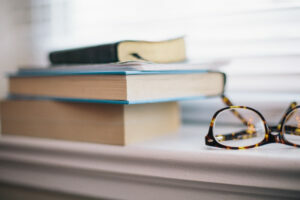 My personal view is that freewriting has an important role in the development of any creative writer – it is a tool in the box and one which we can all use to find out about ourselves as writers. I remember first reading Writing Down the Bones: Freeing the Writer within by Natalie Goldberg and being struck by her phrase: “The aim is to burn through to first thoughts, to the place where energy is unobstructed by social politeness or the internal censor, to the place where you are writing what you mind actually sees and feels, not what it thinks it should see or feel.” Despite already having a degree in creative writing at that point, I’d never really played much with totally free writing. It wasn’t the kind of thing that our tutor Malcolm Bradbury particularly advocated and I’m probably still too firmly entrenched in the way I wrote at that time, (the way I’ve written all of my novels) to ever really feel comfortable with the idea of freewriting an entire book. At the same time, I do understand that it is often only through freeing the subconscious thoughts that we get to the grit of what we want to say. For me, however, there’s another way of doing that. 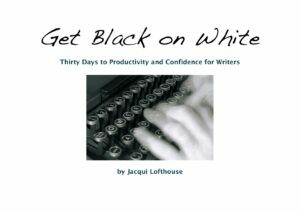 "Get Black on White: Thirty Days to Productivity and Confidence for Writers"
When I wrote my own ebook Get Black on White: Thirty Days to Productivity and Confidence for Writers I did in fact write 30,000 words (the ‘Get Black on White’ programme itself) in 30 days in the form of a blog, although the material was later extensively edited for the ebook edition. The book does, in fact, serve as an ideal companion for NaNoWrimo writers. As I wrote the ebook, it was fascinating for me to see how much I had to share and how easily it flowed. But in the current edition of the programme, I no longer suggest that clients use it to ‘write a thousand words a day’ but rather to help them establish a routine of daily touching base with their writing. For me, what matters most, is that we have a connection with our writing. I believe that the most effective way of writing lies somewhere between the two extremes of freewriting and writers’ block. I think it is vital that we do have a clear sense of roughly what we are going to write in any particular writing session (at least to have a germ of an idea or a sense of the direction of the scene we are about to write) yet we don’t necessarily have to know the detail of how that will be expressed – in other words, we allow for the insights that our subconscious mind will reveal to us. If I were to describe my ideal writing state, it would be that of a kind of hypnosis. Most likely I’ll have Bach’s Cello Suite playing (the Pablo Casals version) as I’m so used to writing to that music that it instantly sends me into a trance and it doesn’t interrupt my flow. I’ll be immersed in the scene in my imagination, seeing it vividly before my eyes. I’m not writing so fast that I’m writing gibberish but neither am I getting so worried about the perfection of the words that I fear writing anything down at all. I’m literally ‘there’ in my imagination, pausing when I need to tune in to the scene in more detail yet never for so long that I’m agonising over the words. I enjoy the feeling of knowing that I am choosing my words carefully and I am, without doubt, a perfectionist. I could absolutely write a novel in a month but it is not, I feel, my own personal style to do so. So you don’t recommend NaNoWriMo? I am personally ‘between books’ at the moment. I’ve been experimenting a lot with other art forms, with an acting class and photography classes (if you are on Instagram or Tumblr or Posterous, do connect with me via the links in these parentheses – I’ve been having great fun with iphone photography lately!) But I have decided to use the momentum that NaNoWriMo has brought to our experience at The Completion Club to good use to make a commitment to myself to move one particular book idea on. Instead of committing to 1600 words a day, I am committing to touching base each day on a new Young Adult novel idea. That’s it – to ‘open the file’ in the words of Mark Forster. Meanwhile, several of the club members are all buddying up with each other via the Nanowrimo forum as well as via our own forum, forming a kind of mini community within a community and I know they will produce some wonderful work. Indeed, I am just a little tempted. To mark the beginning of NaNoWriMo and the launch of my new-style Newsletter on 24th November, I’ve decided to hold a competition. If you’d like to win a free constructive appraisal of 25 pages (double spaced, 12 pt) of your writing in a one-hour telephone call (and via an annotated text) and a copy of my ebook Get Black on White: A Guide to Productivity and Confidence for Writers, simply tweet the link to the ebook page or this blog post or share a link on Facebook to the same between 1st November and 15th November and let me know via Twitter (@jacquilofthouse) that you’ve done so and I’ll put all of the names in a hat and announce the winner here on 16th November. Good luck!